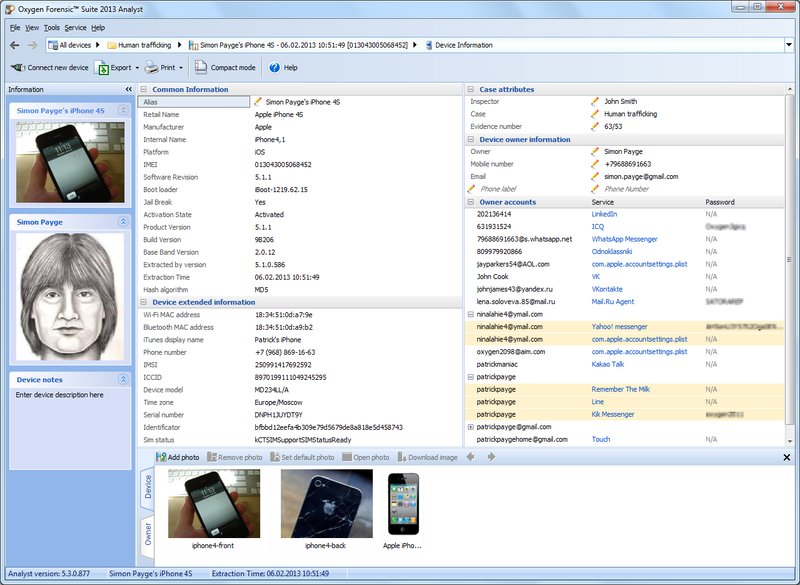 Oxygen Software updates its flagship mobile forensic product, Oxygen Forensic Suite 2013, greatly simplifying Android device connectivity via custom-built generic drivers, and adding an aggregated view for all user account discovered throughout the device in all applications such as social apps, chats, instant messengers etc. Support for 10 popular applications is available along with a range of additional mobile devices increasing the total number of supported mobile devices to 6,800. Oxygen Forensic Suite 2013 can now build a driver based on information obtained from the device. This greatly simplifies connectivity, allowing forensic experts connect and analyze the widest range of Android devices faster and easier than ever. A major addition in this release is the availability of a universal driver for connecting Android-based devices. If an expert does not have the correct driver for a particular Android device handy, Oxygen Forensic Suite 2013 can now build a driver based on information obtained from the device. This greatly simplifies connectivity, allowing forensic experts connect and analyze the widest range of Android devices faster and easier than ever. Connecting an unknown Android device has always been a hassle. Android devices require unique drivers for almost every feature. Certain drivers may fit a small range of devices, while other drivers will only support a single phone model. Some rarely used drivers, especially those used for connecting exotic or foreign market devices, are extremely difficult to find. No single generic driver can match the range of Android devices currently available, making forensic experts look frantically for OEM drivers in order to connect yet another mobile device. Needless to say that OEM drivers are not always readily available, and can be impossible to obtain in field conditions. The latest release of Oxygen Forensic Suite 2013 greatly simplifies connectivity of unknown and exotic Android devices by introducing the ability to build a custom generic driver. Oxygen Forensic Suite analyzes information reported by the device, and automatically builds a generic driver to fit exactly the device being analyzed. These custom-built drivers allow connecting a wide range of unsupported Android devices including those only available in foreign markets. In addition, Oxygen adds support for a range of new mobile devices, boosting the number of supported devices to about 6800. The newest release of Oxygen Forensic Suite 2013 aggregates information on user credentials into a single view, collecting login information, email addresses, accounts and passwords used in all supported applications throughout the device. Supported for Android and iOS devices, this new feature allows investigators to see user names, passwords, emails and nicknames used by device owner in various social networks, chat rooms, photo publishing, file sharing and communication applications. The new feature is a great time saver, allowing forensic experts to glance over user’s login credential in a variety of applications and estimate which apps and services were used more often. The latest update adds support for ten new apps, and enables parsing of the last versions of certain popular applications. Latest versions of Tumblr, TextMe, Ebuddy, Yandex.Maps and Yandex.Browser for iOS and Android are now supported. Exporting data and generating report gets easier, while the reports generated by Oxygen Forensic Suite become easier to read and analyze. The redesigned Table view XLS export becomes more user-friendly, and allows analyzing exported data more conveniently. Old-style exporting and reporting is still available; they’ve been renamed to Table view XLS export (old). 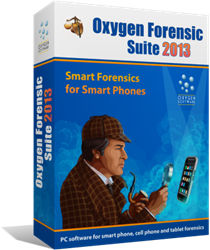 Oxygen Forensic Suite 2013 helps investigators and forensic specialists access and analyze data from a variety of mobile devices such as cell phones, smartphones, communicators, PDA and tablet PCs. Currently supporting more than 6,800 different models, Oxygen Forensic Suite 2013 covers the widest range of mobile devices compared to competition, and allows fully automated acquisition and analysis of supported devices. More information about the company and its forensic solutions is available at http://www.oxygen-forensic.com .